My love affair with coffee started in high school. It got so bad that for graduation I received three coffee makers. Over the years I’ve slugged, gulped, chugged and sipped everything from Folgers Instant coffee to artisan roasts. I’ve loved coffee for over 25 years and now when I spend money at coffee shops I check to see that their coffee was roasted in-house (or at least locally) before shelling out my $2 for a 20 oz coffee. I’m a coffee snob and mass-produced coffee doesn’t pass my lips (unless there’s a dire emergency, but that’s another story). I was recently asked by Nick from GetCoffee.com to review coffee for REV Coffee Roasters, a small artisian roaster in Smyrna, Georgia. They opened up a coffee shop and roasting facilities in an old Mercedes Benz garage and now have the support and following of the entire community. This sounded like my kind of place but because I don’t live within 1000 miles of Smyrna I had them ship me a pound of beans. A non-descript brown bag with a label showed up at my door. 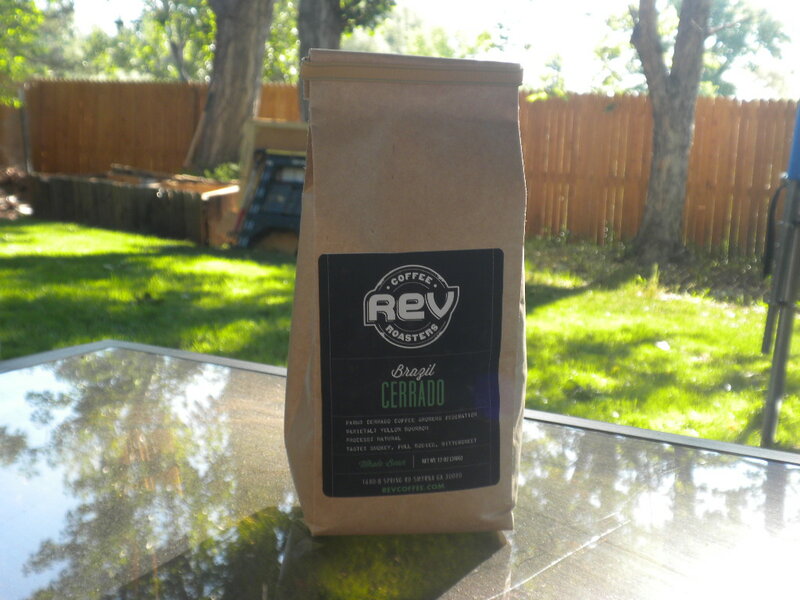 This Brazil Cerrado coffee is from the Cerrado Coffee Growers Feneration. It’s a “yellow bourbon” varietal, roasted under a “natural “ process, with a “smokey, full bodied, bittesweet” taste. I spent the week playing with the proportion of grounds in my 4-cup Mr. Coffee. The first few days I used the normal amount and was rewarded with black-as-pitch trucker coffee and a caffeine-induced headache. It was so strong and the bittersweet taste so overpowering that I was left dehydrated, panting like a dog. After mulling over my problem with this fabulous bag of beans it finally occurred to me that I was treating this like generic grocery-store coffee. Fewer grounds would make a better cup of coffee. This coffee needed to be savored like the $4 chocolate bar I treat myself to every month or so. I tweaked the proportions and was rewarded with a fabulous cup of coffee. My $12.95 bag of beans will last me a long time; much longer than the cheaper stuff I usually buy. Coffee is one of the top three food groups in my world. 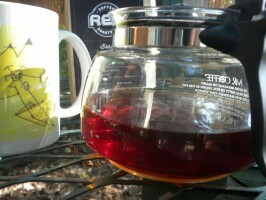 I’m thrilled that I got to try out a small, artisian-roasted coffee from Smyrna. When I’m in that neck of the woods I’ll be stopping by REV’s converted shop to enjoy a cup of whatever they’re brewing up that day. I have absolute faith that it will be divine!